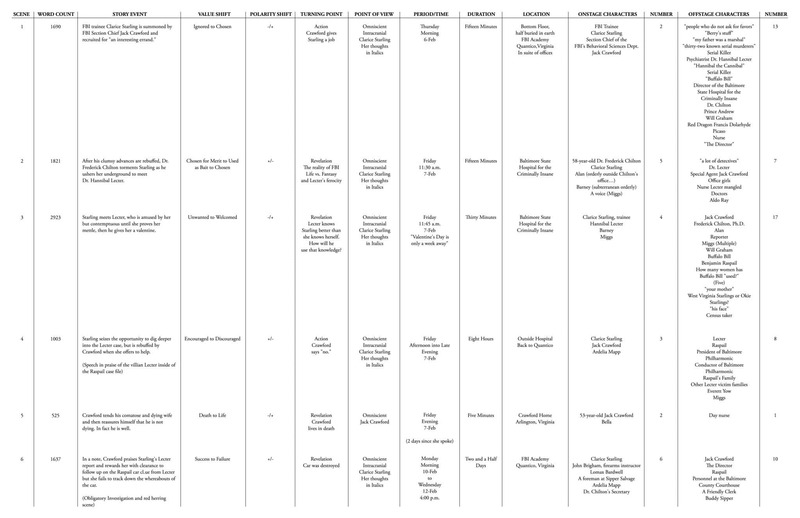 The next three columns on The Story Grid Spreadsheet pinpoint the mechanics of each scene. Essentially, the VALUE SHIFT, POLARITY SHIFT and TURNING POINT columns will tell you how each scene has moved the Story forward. You’ll identify what value is at stake at the beginning of the scene and the value by the end of the scene. Then you’ll determine whether that value has shifted from positive to negative or negative to positive. Lastly, you’ll determine the precise moment in the scene when that shift occurred, the Turning Point. These three columns will give you the perspective necessary to track the success of your Story form. That is whether your Inciting Incidents, progressive complications, crises, climaxes and resolutions in each scene are clearly defined. If you have to struggle to determine what value is at stake in your scene or if there was no discernable moment in the scene when it shifted from positive to negative or negative to positive, you’ll know that you have more work to do on that scene. Story Value: These are human experiences that can shift in quality from positive to negative or negative to positive from moment to moment. For example happy/sad, wisdom/ stupidity, love/hate, freedom/slavery, innocence/experience, etc. Every scene must turn a Story value or it is not a scene. It must start someplace (happy) and end somewhere else (sad) or there is no movement, no change and the Story stops dead in its tracks. You can see the Value Shift, Polarity Shift and Turning Point columns for The Silence of the Lambs’ first six scenes here. Tracking the quality of the turning points is important, as it will give you a sense of flow and continuity of your Story. If you are turning your scenes the same way over and over again, it would be good to know that right? Repetitious turns will turn off a reader or viewer subconsciously. They won’t know exactly why they’re losing the ability to suspend their disbelief in your Story, but they will. No matter how great the scene is, if it is the tenth straight scene that turns on revelation, you will bore your audience. You’ve got to mix it up and surprise the reader at every opportunity. So if they are expecting some big revelation to happen, it’s best to throw down some action. And vice versa. Now it’s time for you to go through all of your scenes and evaluate your value shifts, polarity shifts and turning points. Take your time doing so and be brutally honest with yourself. This process could take as long as two weeks to complete. Set yourself a reasonable goal each day. Today I will evaluate ten scenes. Remember that we all have a tendency to protect ourselves from criticism by writing down “what we intended to do” as opposed to “what we really did” on the page. And we become more and more susceptible to that temptation when we’ve been slaving in the analytical mines all day. So take your time and do this piecemeal. And again, don’t rewrite now. Wait until you’ve finished your Story Grid before you set yourself to that task. It’s okay if you want to write down what you intended to do as well as what you actually did if that will allow you to be truthful. What you don’t want to do is write down what is not on the page. Remember that no one in the universe will look at your Story Grid Spreadsheet. Nor would they really understand what it means anyway. The last thing you want to do is lie to yourself about what is actually on the page. You need to remind yourself that you are going to fix the problems in due course. This is the time to find the problems, not to sweep them under the rug. So if you find that your first ten scenes do not turn or there is no clear value at stake, but a whole slew of values, or that you’ve used the same polarity shift over and over again, don’t sweat it. Just barrel through and write down the truth of every scene in your first draft and leave the “solution” stage for another time. This first draft spreadsheet round is all about finding the problems. It’s not about solving the problems. The only way to solve all of the problems in your draft is to have them all clearly listed in front of you. So you must force yourself to keep the Writer on vacation and also don’t overwork the Editor. Pace yourself. You may not think that you are getting anywhere, but you are. When you finish The Story Grid Spreadsheet, you’ll be able to go through it over and over again and mine seriously valuable insight. But if your spreadsheet is not complete or there are intentions and not actualities listed in it, it will do you little good. It will be more of an excuse list than a helpful tool. Think of The Story Grid Spreadsheet like a knife. You must hone it and keep it razor sharp so that when you need to cut or re-envision a scene, you’ll know exactly where to do it and more importantly WHY to do it. The How of doing it will also come to you over time. Not now, but when you least expect it. Let the writer deal with the How later. You’ll be amazed by how smart that guy is. The first cup of coffee every Tuesday and Thursday belongs to you and Story Grid Shawn. Thanks for taking us through this a few columns at a time, and for reminding us to pace ourselves. I’m not at the editing stage yet, but I’m not nearly as fearful of it anymore and am careful to keep only the writer’s hat on my head right now. As always, thanks! I’ll bet you’re one of those peaceful greenish blue Ameraucana eggs, eh Jack? One great truth I’ve learned about my own writing is that I shy away from truths, great or small. I keep selling myself a bill of goods and trying to do the same for my readers. Truth-telling during editing will inspire truth-telling in writing. I will not flinch, will not look away, however hard it is. I’m eager to throw my money at you… how much longer until your book is released? Thanks. Great to hear. Book is in final proof stages. Final files should be to printer end of next week. Lots of details that we’re tying to make as perfect as possible. All storygrid and stevenpressfield.com subscribers will get a great early deal on it, so stay tuned. I’ll send out an email with more details when we’re ready to push the buttons. I am in the process of editing my book so I look forward to reading your weekly info……….I’m a newbie at fiction writing. You can also just click normally, open it in the browser window, then click the magnifying glass which should appear, and it’ll be full size right in your browser. Just another method of viewing it full size. (1) I assume you’re not talking about a physical Sherlock Holmes magnifying glass, but the one on your computer. But if not, Windows provides a magnifier that you move around the screen to make the print bigger. That’s in the Control Panel under “Ease Of Access”. (2) Of course you know that the spreadsheet shown on this page is not a real spreadsheet, but just a .jpeg picture of one. But I am guessing that when the Grand Enchilada rolls off the presses, the good-hearted Shawn will include an actual spreadsheet template. That will likely be a .xls file in Excel. When that day comes we’ll all download and open it. In Excel you’ll see in the bottom-right corner a slider bar that increases the size of the print. I usually have to boost it to 130-140% before I can make out the print, but it works. Joel, Thank you for this advice! I read this page at zoom 150 but I still needed my actual magnifying glass (I keep it next to my PC) to read this spreadsheet. I wish I’d asked this days ago. But maybe someone else has, as I have, started Shawn’s recommended reading, A Practical Handbook for the Actor. It’s been so helpful, I’m beginning to wonder if I’m reading too much into other parts that really don’t apply to writing. Of course, his suggestion addressed the Story Event column in the Spreadsheet. But I’m also finding it to offer a fresh take on some of our tried-and-true, best practices regarding writing scenes. For instance, in the Chapter 4: Externals, I can see how the same instructions given an actor concerning how to employ external devices (“bodily adjustments, ornaments, and physical states”) could be employed by writers as subtle ways of adding depth and texture to characterizations or even setting. Or is it just me? Ha! I haven’t started the book, but noted it down. Thanks for the endorsement. It adds value to Shawn’s recommendation. Makes sense to me. My best scenes are simply the movies in my head properly described. Not appropriate for every scene, but when it’s better for the reader to fill in the gaps and draw conclusions, I want to stay out of their way. Yes, Joel. Maybe it’s because I’m such a newbie to fiction writing that I’m just now starting to see these connections, but you’re right. It makes all the sense in the world that we, the creators of “the text,” could have so much to learn from the interpreters of it. It’s like being the chef who hears back from a good waiter about how things are being perceived out in the dining room. No you are spot on. Acting and writing are intimately connected. The more you know about how an actor does her job, the better you’ll be able to write. And that book is a treasure trove of sound advice. Then I do see why you recommended it, Shawn. Thank you so much for being all in on this deal. Thank you for your work Shawn – appreciate all the insight and advice. Sometimes exactly when I try to keep the Writer on vacation – all kind of inspiration and urges to write come up. Is this resistance? Or would you agree that taking a break or two – to write down stuff separately, might be good. Sure make notes while you are doing the editing work for writing revisions later on. But don’t stop editing to re-write. Notes like…”in scene 9 instead of having her buy a new coat have her use the money to buy a dog instead” That’s fine. Because you’ll look at that note later on and see if it will fit into the grand revision strategy. It may not. If you stop your editing and write that scene, not only will it be a waste of valuable time, it will throw you off. You might fall in love with that choice to the detriment of the entire story and then forget what you were doing on your edit… It’s a snowball that can become an avalanche very quickly. So bottom line is make as many notes as you want to give you starting points for writing new scenes later on. Just so you remember the big core idea to fix it. But don’t actually write the scene until you’ve got a strategy for the entire revision. Crimenently. Can I preorder “How to Write a Book” right now? I think this is the first time I’ve gone back to catch up on a series of blog posts. Great work. I’ve started this tracker on the YA novel I’m in the process of editing. It’s already opening up my eyes to easily fixed issues. I’m also loving how detailed this process is. I can see how it will help to really pinpoint problem areas, areas I probably won’t be aware of except as a niggling “this doesn’t read right” feeling in the back of my head. Me too! It reminded me of your question about your index cards. Hi Shawn, I’m really enjoying all your Story Grid content. As an exercise I’ve been watching movies, breaking them down by scenes and trying to figure out the value shift for each one; I was wondering, WHO is the value shift for? Is it the hero of the story as it pertains to reaching his/her goal? ; the main character of a particular scene? The audience? Thanks!